One person has been killed and 17 wounded in two separate attacks that involved Palestinian drivers slamming their vehicles into crowds of Israelis. Authorities are treating the incidents as possible terror attacks. In the latest incident a freight lorry with Palestinian plates slammed into a group of Israeli soldiers, injuring three, in an attempt to target the Israeli checkpoint, according to IDF. The incident happened in the West Bank, on Route 60 near Bethlehem. Magen David Adom, spokesman for Hadassan Ein Kerem hospital in Jerusalem told the Jerusalem Post that one 20-year-old soldier suffered serious chest wounds while the other men were admitted with broken bones and injuries to their limbs. The alleged attacker fled the scene of the crash, launching a massive manhunt, involving roadblocks. Israeli forces reportedly fired at the driver in order to apprehend him but to no avail. Later the IDF forces located a vehicle that was supposedly used in the attack while police are investigating the incident as a possible terrorist attack. Earlier on Wednesday a Palestinian motorist slammed into pedestrians near the Jerusalem light rail, killing one Border Police officer and wounding 14 others. Authorities say the attack was carried out in two separate locations along the light rail in Jerusalem. The attacker swerved his van into pedestrians on the corner of Bar-Lev and Shimon Hatzadik Streets before continuing toward Moshe Zaks. After crashing the car, the driver reportedly got out of the car with a metal crowbar and tried to attack people forcing the police officer to kill the man. Chief Inspector for the Israeli police Micky Rosenfeld identified the attacker as a 38-year-old Hamas supporter Ibrahim al-Akri from Shuafat. The incident comes a month after a three-month-old baby was killed and seven others suffered injuries when a Palestinian crashed his vehicle into a train station in Jerusalem, hitting passengers as they got off a train. 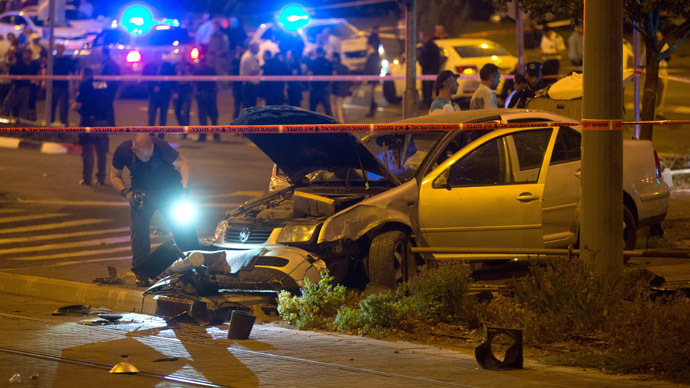 Police said the driver of the vehicle was shot and killed by officers after he got out of his car and began attacking passersby with an iron rod, Israel’s I24 news reported. 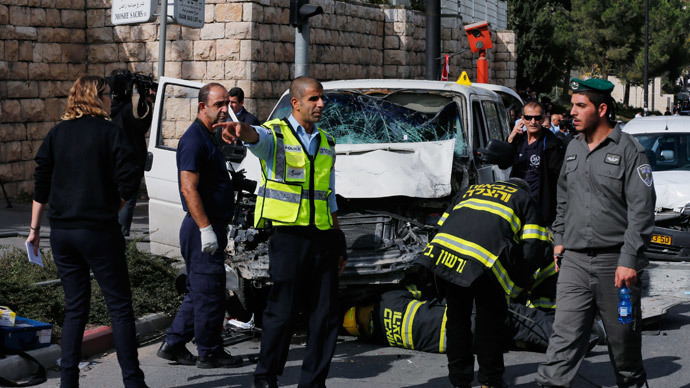 Authorities have identified the driver as Ibrahim al-Akri, from Shhuefat, East Jerusalem, Haaretz reported. On Wednesday morning, Israeli police confronted Muslim protesters at Jerusalem's Al-Aqsa mosque, which is considered to be Islam’s third most venerated religious site, police spokeswoman Luba Samri said. "Dozens of masked protesters threw stones and firecrackers at security forces, who then entered the Temple Mount and pushed the demonstrators back inside the mosque," Samri told reporters. Tensions between Israelis and Palestinians flared following last week’s assassination attempt against Yehuda Glick, an American-born rabbi and right-wing activist who campaigns for expanding Jewish access to the site of the Al-Aqsa mosque, which Jews refer to as the Temple Mount. Glick remains hospitalized in stable condition. On Tuesday, Fatah urged Palestinians to prevent an Israeli protest against Glick’s shooting at the Temple Mount compound Wednesday. According to The Times of Israel, Fatah called on its Facebook page Tuesday for “all Jerusalem residents and Arab Israelis” to keep protesters away from the religious site.